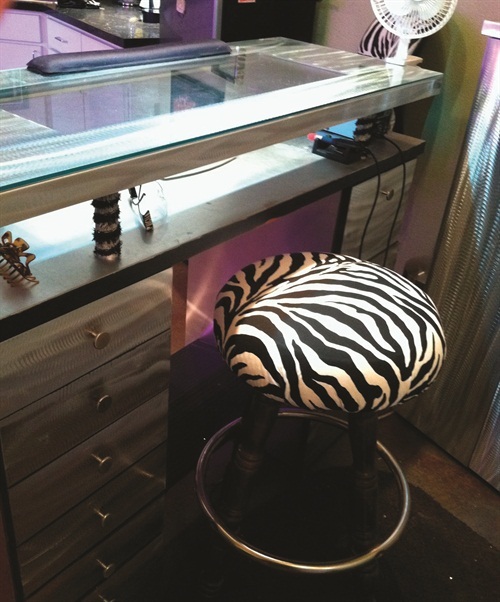 When G Elizondo couldn’t find a manicure table to meet all of her specifications, she designed her own. We love how she built up, not out, adding an extra horizontal tier to get the clean workspace she desired. When G Elizondo couldn’t find a manicure table to meet all of her specifications, she designed her own. 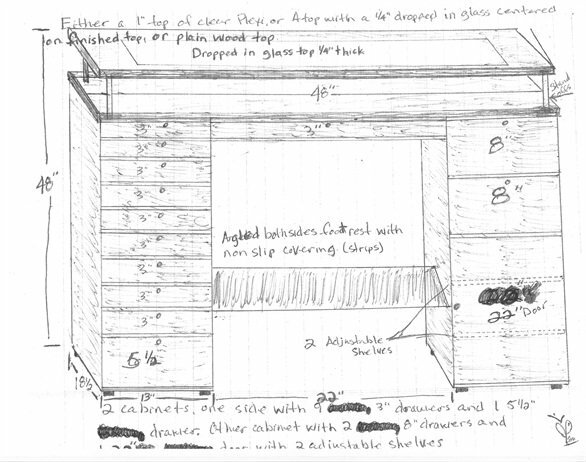 Elizondo, who works at Radichi Salon & Spa in Las Vegas, drew out her blueprints then had a carpenter build it out. We love how she built up, not out, adding an extra horizontal tier to get the clean workspace she desired. This table isn’t for sale, but Elizondo’s happy to share her blueprints with NAILS readers for those of you who want to get a similar table built locally. 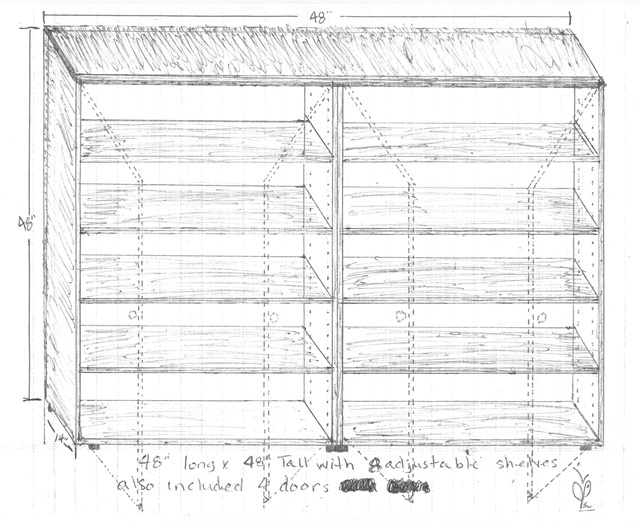 You can view her blueprints below (a web exclusive!). If you'd like her blueprints in a slightly larger size, e-mail sree.roy[at]bobit.com. • The extra tier houses two UV nail lamps (one on each side) for convenient gel curing. 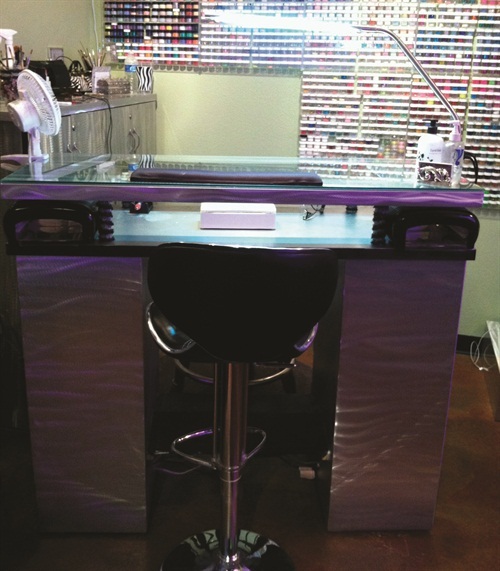 • A dropped-in piece of glass that’s centered on the top tier allows clients to see salon fliers that are placed on the lower tier, without the risk of the tech spilling something on the flier. • A shared footrest near the table base has room for both the client’s and the tech’s feet. • Tools such as an e-file and safety glasses are stored on the lower tier, meaning the top work surface is unobstructed. • Deep drawers on the right side mean that a tall monomer bottle can stand up (in the top drawer) and an entire gallon of acetone can be stored (bottom drawer). • The entire left side is drawers, which provides tons of storage, especially for techs who don’t have storage space elsewhere in the salon.